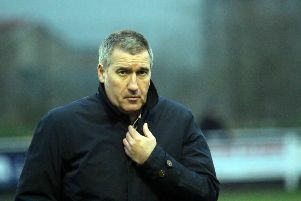 Banbury United boss Mike Ford is only too well aware that next month’s fixture list includes games against the current top two in Evo Stik League South. The Puritans face high-flying Stourbridge and premier division central leaders Kettering Town in the space of four days. And Ford will want his side to go into those games on the back of good results against Lowestoft Town and Needham Market. United entertain Lowestoft on Saturday and Ford will be looking for his side to extend their unbeaten three-match run. Ford said: “The next two games are the most difficult ones because Kettering and Stourbridge are ones we’re not expected to win. Kettering look to be grinding out results with the experience they’ve got. “I remember us playing Kettering Town, who were second at the time, and then Chippenham Town, who were top, in the space of four days. We got a point at Kettering and that helped us to win 1-0 at Chippenham. Ford should have a full squad available for Saturday’s clash with Lowestoft Town at the Banbury Plant Hire Comminity Stadium apart from Lee Henderson. But Edmund Hottor will be back after serving his one-match suspension and Charlie Hawtin should have recovered after missing the St Ives Town game through illness.